Hollow pottery figures such as this are referred to as “baby-faces,” since their plump bodies and facial features are similar to those of an infant. The eyes are almond-shaped, elliptical, or a simple slit. A protruding head, probably the result of cranial deformation, is another common feature. They are usually seated, with legs spread and arms raised or resting on their legs. Infants were a recurring theme in Olmec art. 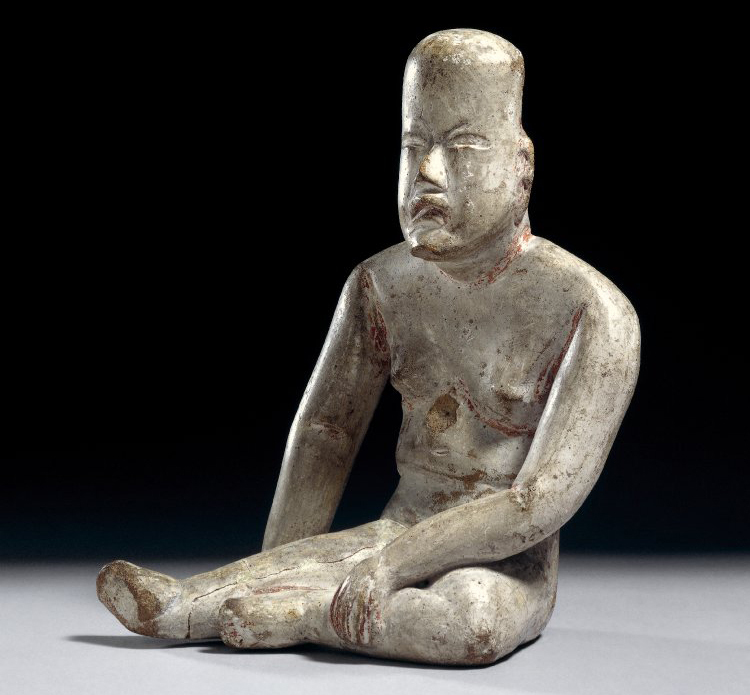 Baby-face figurines often present a mixture of human and animal traits, with features such as a feline mouth with down-turned low corners, a flaring upper lip and ‘flaming’ eyebrows. Their bodies are naked and show no indication of gender. 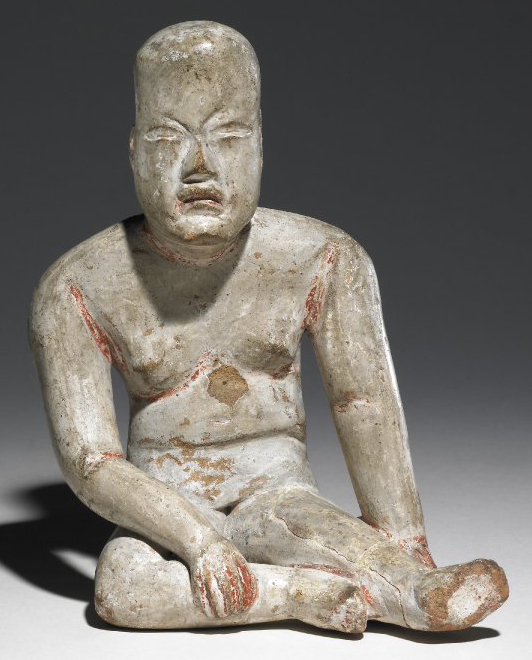 These “were-jaguar” infants are also carved on monumental altars and stone sculptures, lying on the lap or in the arms of a person. The different sections of the body were produced separately and joined together at a later stage. The finished product was covered by a thick white slip and then polished to a lustrous appearance. Red cinnabar or haematite powder was often applied to highlight symbolic details or features incised on the figures. These pigments were also used in human burials and probably had a significant role in Olmec rituals. One rare find of a group of Olmec figurines, excavated in situ, revealed standing figures arranged in a semicircle, apparently engaged in an act of collective veneration or worship. This figure may once have formed part of such a scene. Cite this page as: The British Museum, "Olmec figurine," in Smarthistory, February 28, 2017, accessed April 20, 2019, https://smarthistory.org/olmec-figurine/.